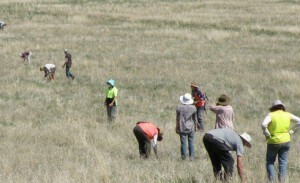 Loddon Plains Landcare Network » What is the GOANNA Project? The GOANNA Project is a landscape-scale restoration project across the Loddon Plains of north central Victoria. The Loddon Plains is home to diverse natural and cultural assets. The importance of this region as a primary food production area both locally and internationally is also recognised. The LPLN regards that a healthy environment is the foundation of healthy agriculture and a sustainable community. In 2010, the Norman Wettenhall Foundation and the LPLN expressed interest in working together on developing a landscape connectivity project. The Foundation provided $30,000 to the LPLN Committee of Management to develop the project, its vision and a blueprint for long-term action to protect and enhance the native flora and fauna of the area, with a long term goal to achieve large-scale coordinated action and landscape change. In 2012, the Foundation provided a further $30,000 to the network to start putting the blueprint into action through the development of larger scale projects. These projects are currently under development using the Investment Framework For Environmental Resources (INFFER) project development system. Along with on-ground works, community education will be another important aspect of the GOANNA Project. Workshops and field days will be extended to the wider community who want to learn more about the importance of biodiversity in sustainable farming enterprises.